Spinal stenosis refers to narrowing of spinal column that exert undue pressure on the spinal nerves and may lead to disabling pain, numbness and loss of function in the area of involved nerves. The most common areas of spinal column narrowing are upper neck and lower back. This is primarily because spinal column is naturally narrow in this region (cervical and lumbar curvatures). What Are the First Signs and Symptoms of Spinal Stenosis? In almost 50% patients, there is no specific symptom or compliant. The onset is usually gradual and pain/ numbness worsen with time. The severity of symptoms is also dependent on the site and severity of stenosis. In upper cervical stenosis, the tingling or numbness is generally experienced in upper limbs while in lumbar spinal stenosis, symptoms are more pronounced in lower limbs. What Are The Causes Spinal Stenosis? Congenital causes: In some individuals, inherent caliber of spinal column is narrow that increases the risk of developing spinal stenosis while growing up. Acquired causes: In other individuals any expanding mass that press upon spinal column can lead to spinal stenosis. Spinal disc herniation is another common cause of spinal stenosis in elderly population. With advancing age, wear and tear changes in the vertebral bodies can lead to degeneration of inter-vertebral disc that press upon spinal column and leads to narrow caliber as a result of inflammation and damage. How To Diagnose Spinal Stenosis? Spinal stenosis is difficult to diagnose because of relative similarity with other degenerative changes of spine; however, different diagnostic modalities like X- ray, MRI of spine and CY myelogram are helpful in identifying site, size and severity of lesion. 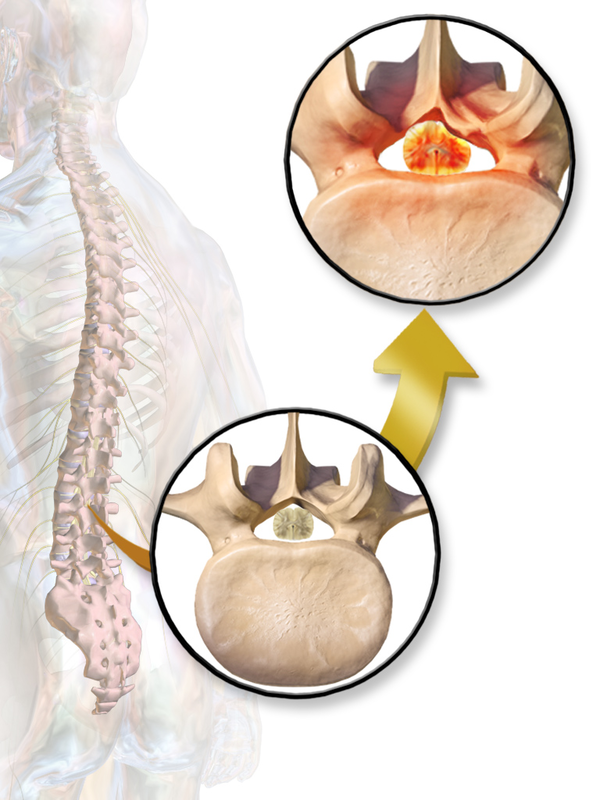 Surgical Treatment of Spinal Stenosis, When Is It Necessary? A variety of treatment options are available depending upon the site, severity and symptoms of stenosis. Generally surgery should be avoided in most cases because of substantial risk of infection, clot formation, nerve damage and tearing of spinal membranes. In cases where the cause of spinal stenosis is herniated inter-vertebral disc or vertebral fracture, laminectomy or radiculopathy like procedures can be performed to relieve the pressure from the spinal column. For individuals who are poor candidates of surgery, pain medications, steroid injections and anti inflammatory medications are extremely helpful. For unbearable pain that is not responsive to regular pain medications, opoid provides excellent relief but caution must be taken to avoid potential to drug addiction. Anti- depressants and anti- seizure medications. In order to prevent degenerative bone disorders and injuries, it is recommended to maintain a healthy lifestyle and maintain regular physical activity. Muscle strengthening exercises of lower back are helpful in alleviating the stenosis and pain symptoms. By changing the posture that is better able to support the body; stress and strain on nerves can be minimized that can help in relieving pain symptoms and also improve range of motion. In episodes of acute pain, alternate hot/ cold compresses can help in decreasing tissue inflammation and swelling around the joints and tissues. Using a support like walker or a cane can also help in decreasing pain symptoms by assisting in movements that relieves direct pressure from the vertebrae. Causes Neck Pain – How to Prevent Neck Pain?